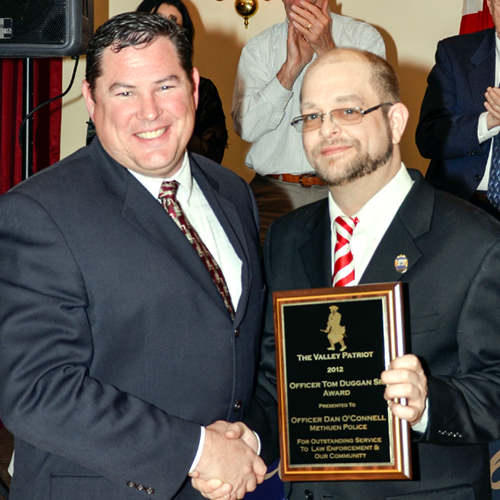 The Valley Patriot bestowed the Officer Tom Duggan, Sr., Law Enforcement Award at the newspaper’s annual Anniversary BASH, held in March each year. This award will go to one civilian and one police officer or firefighter every year. My grandfather, Officer Tom Duggan believed that it was the little things a police officer does every day that made the biggest difference in people’s lives. While he worked on many major cases and high profile crimes in Lawrence he always said that it was the day to day work that he did helping people in small ways that really made him love his job. On March 16, 1990, he lost his life in the line of duty. Unfortunately, I was unable to meet this amazing man, as I was born after his tragedy. But from everything I have read and been told, he was obviously a man who loved being a police officer… and it was because he loved being able to make a big difference in little ways. This year, the Duggan family and The Valley Patriot have created the first ever “Valley Patriot, Officer Tom Duggan Sr. Law Enforcement Award” and grant it to Methuen Police Officer Dan O’Connell. This officer has done such great work in the community and, a few summers ago The Valley Patriot was there to see it first hand. One day at the July 4th celebration in Methuen he made a difference in the life of a little girl and the expression on her face (see photo) surely showed it. 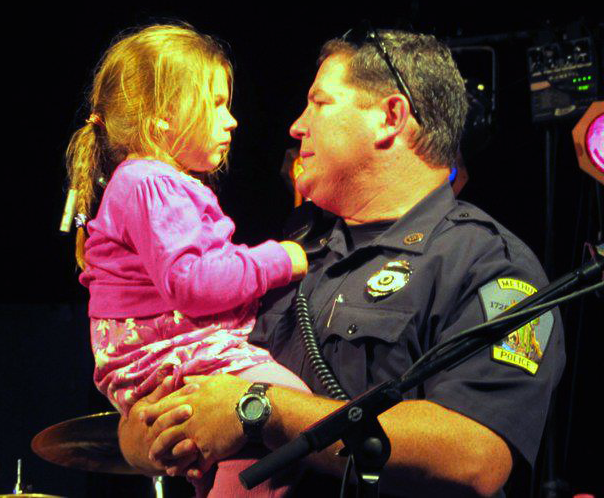 Officer O’Connell saw a little girl at the event who was crying and terrified because she had lost her mommy. In that one instant when this officer found the lost little girl, he picked her up, held her and told her that she would be ok. With just a look and a few kind words, this little girl went from tears to a precious smile because Officer O’Connell was able to show the true meaning of “making little things count” by comforting her until her parents were found. We need more police officers like this one and for sure we need more people to give them awards. Tonight, an award is being given to a police officer for showing kindness and concern for a little girl. An award for showing love and appreciation for the people he is charged with protecting. It is with great honor that The Valley Patriot and the Duggan family present the first public safety officer to ever receive the Tom Duggan Sr. Law Enforcement Award: Methuen Police Officer Dan O’ Connell.